It’s winter lights kickoff week in the region and that means a whole lot of lights sparkling – millions of them in fact, and for the next four months of celebration. As the hundreds of thousands of visitors who come for the lights can attest, ’tis the season once again to be dazzled! 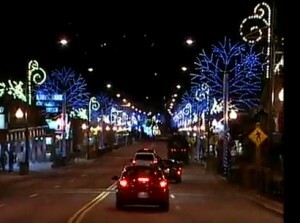 Pigeon Forge has over 5 million lights strung throughout the town for its Winterfest season, and Gatlinburg has converted its entire Winter Magic array of decorative and display lights throughout the city to LED lighting, for a tremendous energy saving as well as adding unique features to the animated displays. Sevierville continues to run its lights all the way south from Interstate 40, welcoming visitors along the highway with a blaze of cheer as they drive into our area. Sevierville opens the area’s lighting with Monday celebrations, while Pigeon Forge lights up on Tuesday, and Gatlinburg celebrates with its annual lighting on Wednesday. So hang on and don’t get dizzy from all the sparkles! In fact, do the smart thing and take a Trolley Tour of Lights this season. Guided tours by trolley are available in both Pigeon Forge and Gatlinburg. This is the way to make sure you see all the best displays, and in comfort. Pigeon Forge starts its Winterfest celebrations on Tuesday, November 6 with its Salute to Veterans Parade, ending in Patriot Park for food and entertainment, and a fantastic view of those five million lights on display across the whole town. Gatlinburg on Wednesday, November 7 handles its kickoff with a cookoff – the Winter Magic Kickoff & Chili Cookoff in downtown, 5-8 pm, serving thousands of cups of chili as participants compete for a variety of awards. There will be voting for the best chili, live entertainment, and all the lights you can imagine!